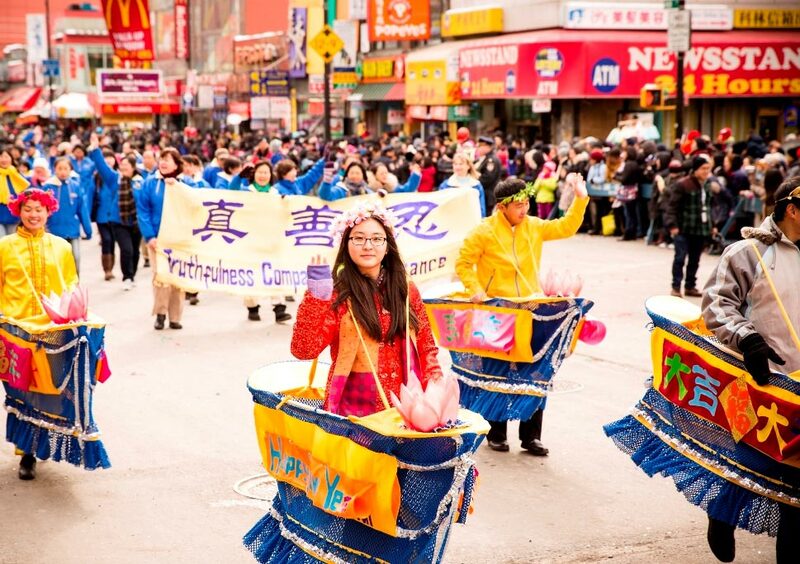 Spectators weren't held back by cold weather at the annual Lunar New Year parade in Flushing's Chinatown in New York City on February 8. The playful golden dragon led the Falun Gong procession, engaging both children and adults with holiday cheer. 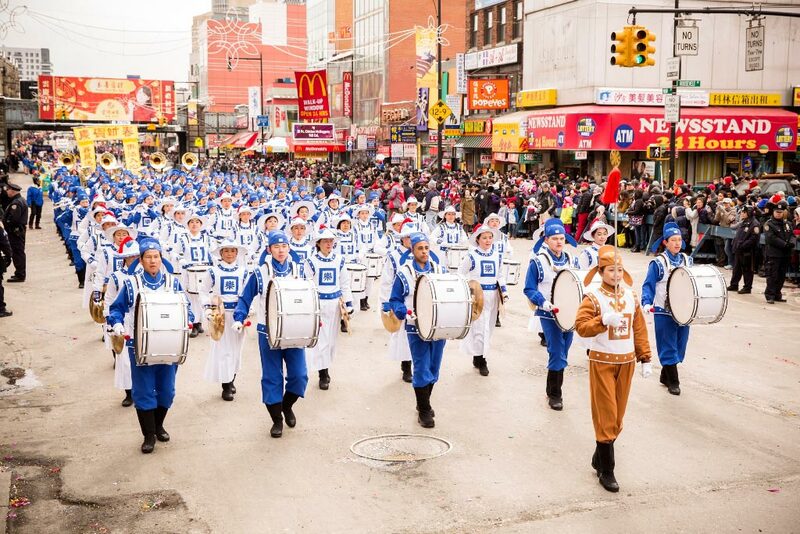 The Divine Land Marching Band, composed of Falun Gong practitioners, was a major attraction at the parade. Its high-spirited drum beats and catchy melodies resonated with people's hearts, evoking smiles and warm applause. 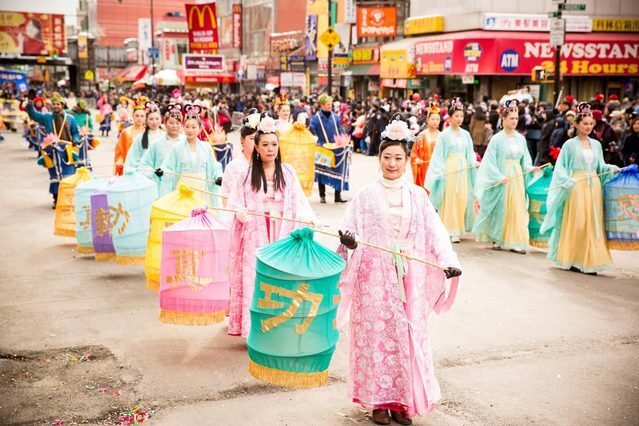 Practitioners dressed as heavenly maidens—holding New Year lanterns with the words “Falun Gong” and “Truthfulness-Compassion-Forbearance”—added to the spirit of beauty and peace, while practitioners rocking in “Land Boats” enhanced the festive atmosphere with colorful art. The Divine Land Marching Band played “Falun Dafa is Good,” “Deliver the Treasure,” “Triumphant Return,” and other pieces. The uplifting music was filled with positive energy, helping to ring in the Year of the Horse. The band has participated in this annual Chinese New Year parade since 2006 and debuted “Triumphant Return” at this year's festivities. The piece represents the journey of Falun Gong practitioners and the triumph of righteous values, according to Mr. Liang, the spokesman of the band. Ms. Zeng from Malaysia made a trip to Flushing especially for the Chinese New Year. She was excited to see the performance by the Divine Land Marching Band. Ms. Li, another spectator, commented that seeing the Falun Gong procession warmed her heart. The spectators' sentiment was shared by the organizer of the parade. Peter Du, director of the Flushing Chinese Chamber of Commerce, said that he advocates for the Falun Gong entry wherever he goes, including at the New York Mayor's Office.